Margo releases Paddy and receives a severe beating, and Bea reveals full details of Joan's trap to Lizzie. The script includes references to Butterfield's Plant Nursery and Lyn Warner, as well as a hint of the similarity of Sally's story to the previous child abuse plotline involving Gail Summers After taunting Paddy with being afraid of the dark, Margo lets her out of the store room when she hears her talking to her mother. Joan walks into the rec room just as Paddy is attacking Margo, and she takes them both off to Erica's office, where the classification meeting with Dr Weissman is just finishing. Paddy lags on Margo for locking her in, and Margo is sent to solitary. Dr Weissman seems to regard Paddy's admission that she deliberately hit Margo rather than lashing out blindly as an indication that her cure is on track. Chrissie tells Neil that Joan knows about them: he tells her he will amend her medical records to justify her visits. Bea wonders where Margo has got to and Paddy tells her she's been sent to solitary, but seems somehow to escape Bea's wrath over the lagging. Erica asks Neil why Chrissie is paying so many visits to the infirmary: he brandishes the (presumably amended) file and says he suspects Chrissie may have a gynaecological problem, perhaps a cyst, and would like her to have further tests. Sally feels under pressure at home and decides to hire Maxine to look after Michelle despite her husband's disapproval. When Lizzie puts her on the spot, Bea tells her the details of the plan to frame Joan, but tells Lizzie to keep it quiet. Maxine goes to work at the Dempsters' and immediately notices a bruise on Michelle's arm: Sally says she's very accident prone and fell downstairs. Joan approaches Steve with a proposal to split his "profits": he tells Bea next morning, and she gives him a payoff to pass on to Joan to cement the deal. Bea tells him the best person to pass it on to Joan would be Barbara, as Joan already suspects that he and Barbara are having an affair. Sally is disappointed when Peter refuses to take her with him on a business trip, even though they now have Maxine to look after Michelle. Later on, Sally reaches breaking point and nearly throws a pot of boiling coffee over Michelle. Meg offers Bea some options for work release, but Bea says she is happy to wait until she hears what Steve has managed to arrange for her. While Sally is out shopping (and nearly shop-lifting), Maxine calls the doctor for Michelle as she has a temperature. Steve tells Bea he's arranged a placement with a local newspaper: Chrissie makes a snide remark and Lizzie confides in Bea that she's not the only one who thinks Bea has sold out. Dr Kelly examines Michelle and he finds the recent bruises along with some older ones. Sally arrives home and is annoyed that Maxine called in the doctor, and sends her home. The doctor talks to Sally privately and lets her know that he suspects her of hitting Michelle. Erica archly denies any knowledge of the plot against Joan when Bea mentions it during her interview about job release. Meg advises Maxine to report Sally if she has any evidence that Michelle is being maltreated. Neil finds out (again!) about Chrissie's record for prostitution from Meg and Steve. Barbara overhears Bea and Lizzie discussing the plot against Joan. Chrissie is examined by a doctor and is sent to hospital for tests. Neil tells her it will give them the opportunity to spend a few hours together. 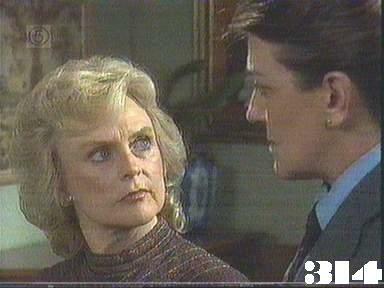 Barbara offers information to Joan in return for her papers. Armed with the information, Joan goes to Erica and reports Steve and Colleen for stealing goods from the buyup and selling them back to the women .